This Easy Savory bread Pudding with mushrooms is full of your favorite mushrooms, dredged in a rich custard and baked with bread cubes. Make ahead side dish for the holidays that is elegant yet simple to make! It’s that time of year where if you are like me you are looking for side dishes that are a little more special than normal. 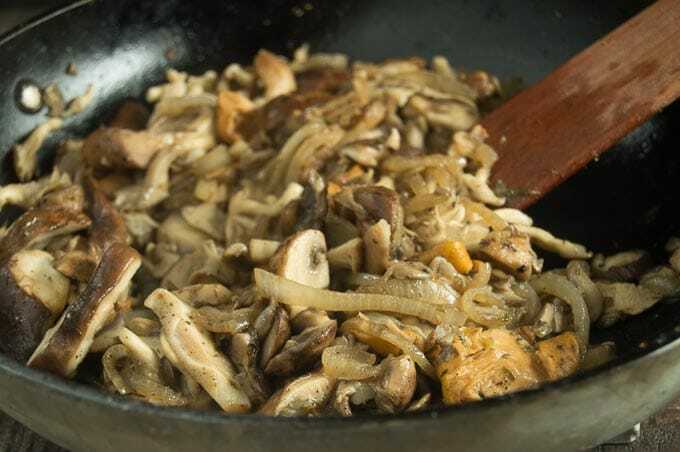 Todays recipe for Easy Savory Bread Pudding with mushrooms is an excellent example of how a simple dish can be both a comfort food yet something out of the ordinary. What is the difference between Savory Bread Pudding and Stuffing? 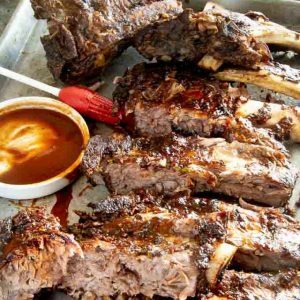 When I served this to my family everyone loved it. But when they first saw it they thought it was stuffing. 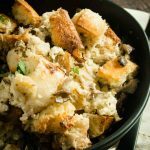 This Savory bread pudding with mushrooms is very much like a stuffing but there is one major difference. Bread pudding uses a much richer liquid than the stuffing, or dressing will. Bread pudding is made with a heavy cream to soften the bread, while a stuffing or dressing uses a broth such as chicken or vegetable to moisten the bread. The Savory Bread Pudding once baked, has the same crunchy areas that a stuffing has, but where the creamy custard from the heavy cream goes its much more decadent. 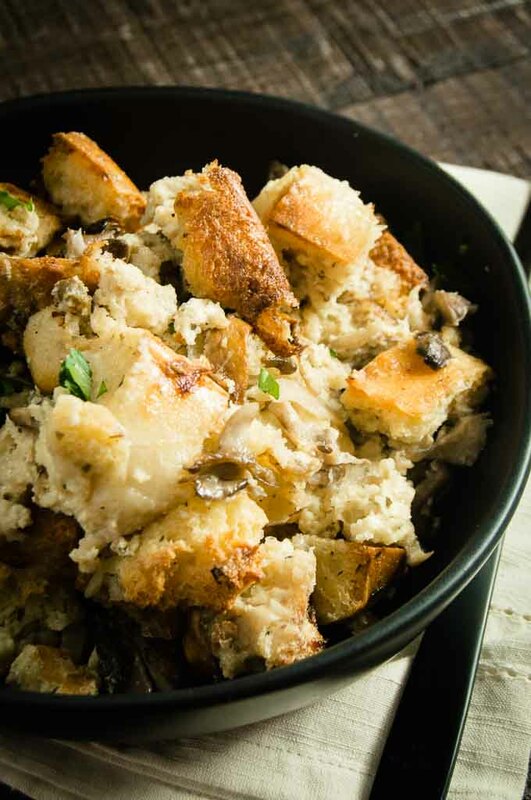 How do you make an Easy Savory Bread pudding with Mushrooms? 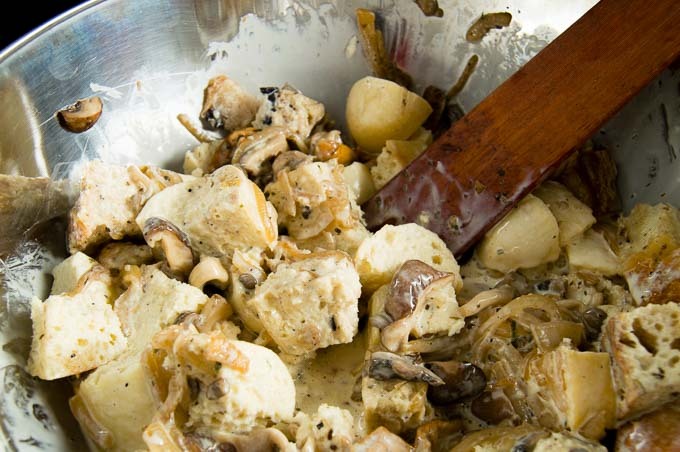 The first step in making bread pudding with mushrooms is of course to pick out your favorite mushrooms. 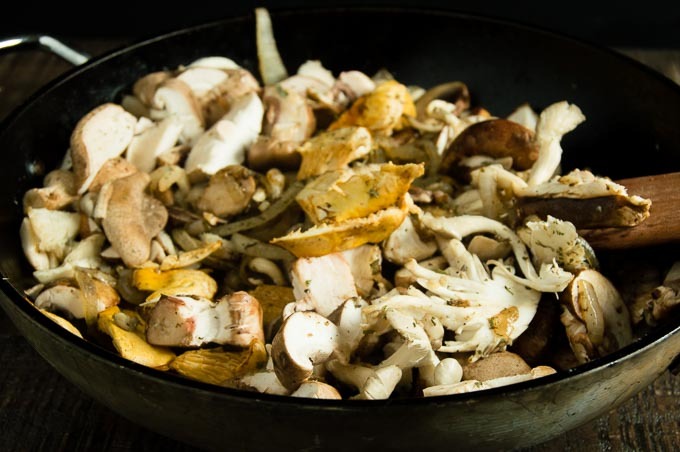 You can use whatever mushrooms you or the people you are serving like. 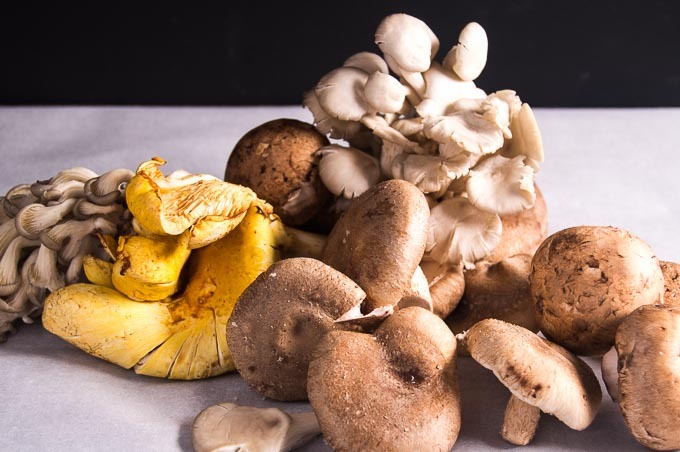 They can be as simple as crimini or button mushrooms, or more exotic ones like Shitake, Chanterelle’s or Porcini’s. I do suggest you use fresh mushrooms for the boldest of flavor. However you could also use dried mushrooms if you dehydrated them before using them in this recipe. I try to use different colors of mushrooms so that the bread pudding has lots of different colors and textures in the final dish. But honestly, it tastes just as great if you use all the same kind of mushroom. 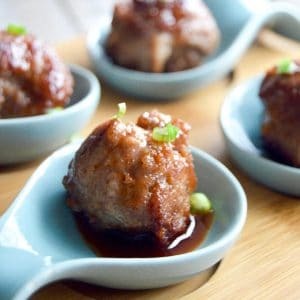 You will cut up the mushrooms into smaller pieces and sauté them until softened before adding them to the bread cubes. You’ll notice in the photo here that the mushrooms darken a little in color and shrink while also releasing some liquid when you sauté them. Once you make the custard with the heavy cream you will stir the mushrooms and the bread cubes all together. As an option you can use a couple of kinds bread to also add to the contrast. I used all sourdough in this photo, but I often use half pumpernickel and half sourdough to get a color and taste contrast. Note, the easy savory bread pudding with mushrooms will seem very soupy like it does below. Don’t worry, that liquid will all absorb into the bread cubes once you bake it. All of this deliciousness then gets placed in a baking dish and baked until golden brown on the top and crispy on the top. The center bread cubes hold their shape but stay soft and rich with the absorption of the custard. 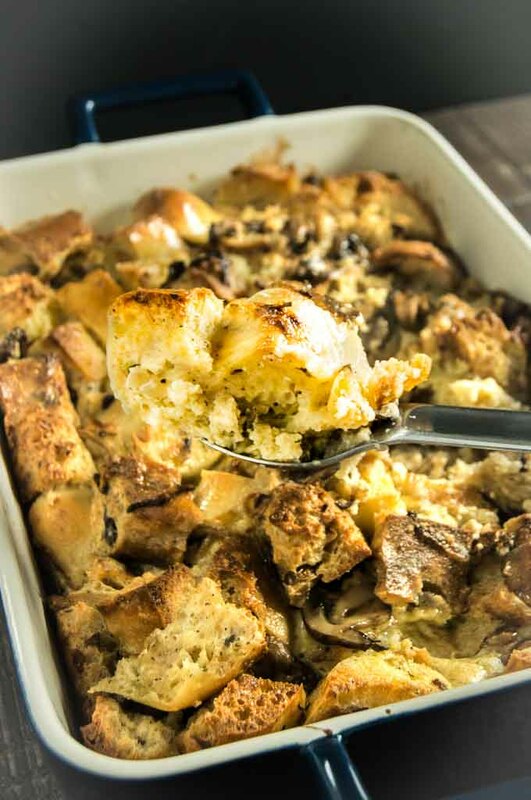 What meals can you serve Easy Savory Bread pudding with mushrooms with? This easy side dish pairs beautifully with many holiday meals such as your thanksgiving dinner turkey like this one from Kristin at Yellow Bliss Road. It would go with ham at Christmas (I have a recipe here for a Bourbon Mustard Ham.) 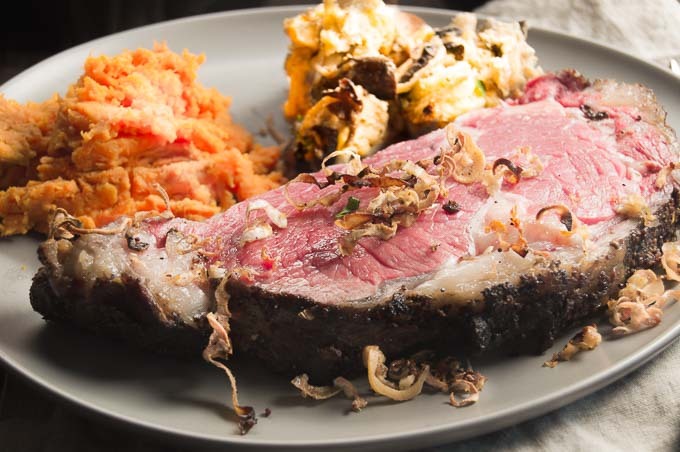 But my favorite meal to serve it with is this recipe for Horseradish Crusted Ribeye Roast pictured below. It was a huge hit at our holiday dinner party! 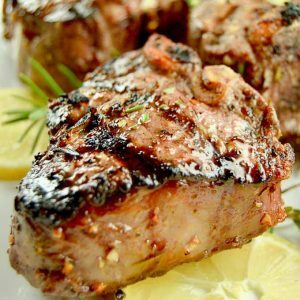 Craving more recipes for Holiday entertaining sign up for my mailing list here at the bottom of the page. or PIN THIS TO YOUR HOLIDAY MENU PLANNING BOARD for when you are looking for ideas to give at Christmas! Also Follow me on Pinterest to get more ideas to have for making easy delicious meals and appetizers for any entertaining! Grease 2 quart glass rectangular baking dish with 1 tablespoon of the butter. Set aside. Heat remaining 2 tablespoons of butter over medium heat, then saute onions, salt and pepper until softened about 4 minutes. then add mushrooms, and stir for about 5 minutes. then add garlic and stir for 1-2 minutes more. Remove from heat. In a large bowl, whisk together 5 eggs for about 1 minute until well blended. Add the cream tobassco sauce, Worcestershire sauce and cayenne and stir until well blended. Pour entire bowl into pregreased baking dish. Bake for 50-55 minutes until top us golden brown and bubbly. 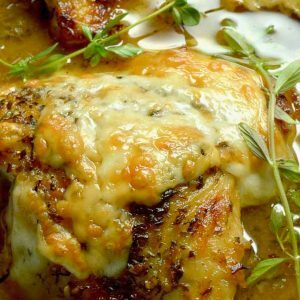 This recipe is adapted from Emeril Lagasse's recipe for exotic mushroom bread pudding in his book Emeril's Creole Christmas. A great side dish, hearty enough to be an vegetarian entrée .